BROTHERHOOD: Sipho and Kholo Montsi are the future stars of tennis in SA. 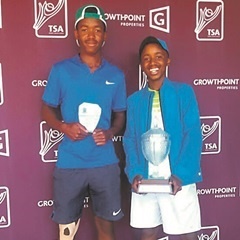 Johannesburg - Rising tennis star Kholo Montsi has been crowned the Boys Under-16 Growthpoint Junior Masters champion in Potchefstroom. Montsi beat Robbie Arends from Western Province 6-2, 6-4 in the final. Kholo and his older brother Sipho opened up to City Press a few days ago. The brothers said that, while they excelled at other sports too, tennis was their sport of choice. Sipho, for instance, was great in cricket. So much so that he even made it to provincial level, but finally settled for tennis. “I was good in other sports and I was even selected to play cricket at provincial level, but I didn’t compete because I had already decided to play tennis,” Sipho said. The younger of the siblings, Kholo, competed in karate from the age of seven. He said: “I was selected for a karate team that travelled to Barbados". While the boys have the ability to compete in a variety of sports, tennis remains their passion. Kholo’s love for tennis came through his enjoyment of individual sport, as there were not a lot of people playing tennis in his neighbourhood. “When I was seven or eight I had to choose which sport to play and I chose tennis because I thought it was fun". Kholo said tennis allowed him to think independently when he was in in tough situations on court. Seeing his brother Sipho travel for tennis also played a role in Kholo’s love for tennis – he loves to travel too. Sipho first held a tennis racket at the age of nine. Little did he know that he would one day get praise from international coaches. Sipho lost his first-round match in the Australian Open juniors, but he then made headlines when Judy Murray, Scottish tennis coach and mother of former world number one Andy, congratulated him on his performance. Murray tweeted a photo with Sipho and said: “Today I watched the most naturally gifted young player Siphosothando Montsi from South Africa". Sipho said that while the media was daunting, he chose to focus on his game. The prodigy joined the team SA Davis Cup squad as an official hitting partner against Slovenia. Sipho said he wants to play in the International Tennis Federation juniors tournaments and hopefully reach the top 100 ranking. Kholo’s tennis pro role model is 16-time Grand Slam singles titles champion Rafael Nadal for his “fighting spirit”. The boys study at the online school Laurel Springs and Sipho is studying for his matric certificate. Meanwhile, South African tennis stars Kevin Anderson and Raven Klaasen received nominations in this year’s Association of Tennis Professionals World Tour Awards. The candidates for the awards are the top 25 players in the Emirates ATP race to London and top 15 teams in the doubles race as of September 11 2017.